Happy "Spring" to one and all! I use that word very lightly as Minneapolis just got hit with Snowmaggedon #3 IN APRIL, leading to a 2-hour late start in many school districts on Friday. While I very much enjoyed the extra sleep (Daylight Savings Time hit me like a ton of bricks this year), I did not enjoy the hour of shoveling to make the driveway bike-friendly. Luckily we are poised to hit upper 50's the next few days, and 71 by Wednesday! Hallelujah! My apologies, yet again, for not posting more over the winter. I've thought about starting app mash-up posts many times and something always seems to get in the way. But no more! 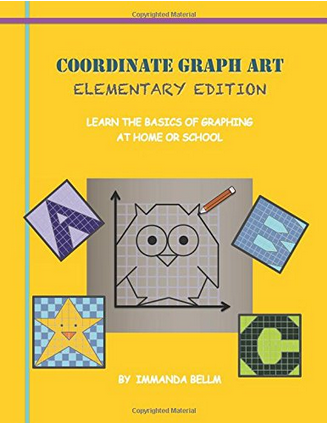 The time has come to start networking again, as I gear up to write "Coordinate Graph Art for Beginners" this spring and summer. I'll be posting progress updates and downloadable sneak peeks for my awesome readers (& Pinterest/Twitter followers) as the weeks march on. Being a Technology Integration Coordinator, naturally I'm getting peppered by questions of "Why don't you release your existing books in e-reader format?" And the answer has always been, because the puzzle is on one page and the graph paper is on the other. Kids would have to toggle back and forth between the graph paper and the puzzle. It is feasible with the digital copies of my books that I just posted on TpT: Coordinate Graph Art: Teacher Edition, Coordinate Graph Art: Student Edition, and Advanced Coordinate Graph Art: Student Edition. Advanced Coordinate Graph Art: Teacher Edition has been posted for some time now. My existing books are in "print format" so they read best with multi-page selected so that the graphing directions show on the left, and the graph on the right. 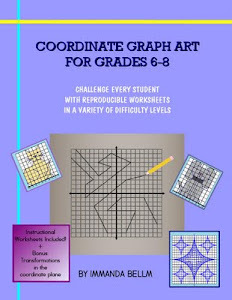 Then, either the teacher or the students take a screen shot of the graph, import it into an annotation or note-taking app, complete the puzzle, and then submit their work electronically back to their teacher. Or, just show it to your teacher when done! This will make coloring the final product much more engaging and less messy than using pens, markers, or crayons. 1. 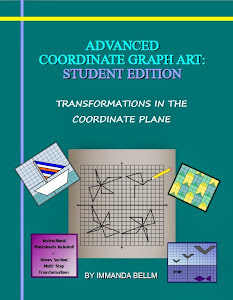 Buy the eBook edition you desire (either regular or advanced) in both the teacher and student edition. 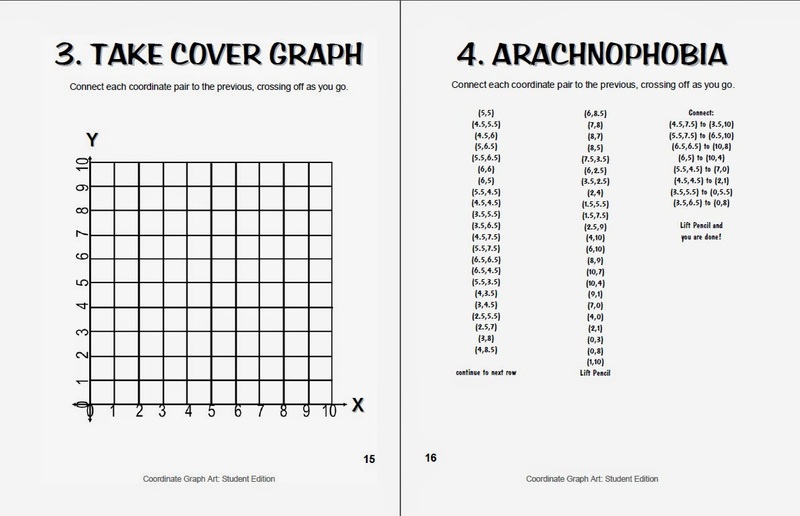 The teacher edition has the keys, while the student edition has the correct page format to "capture" the instructions next to the correct graph paper. 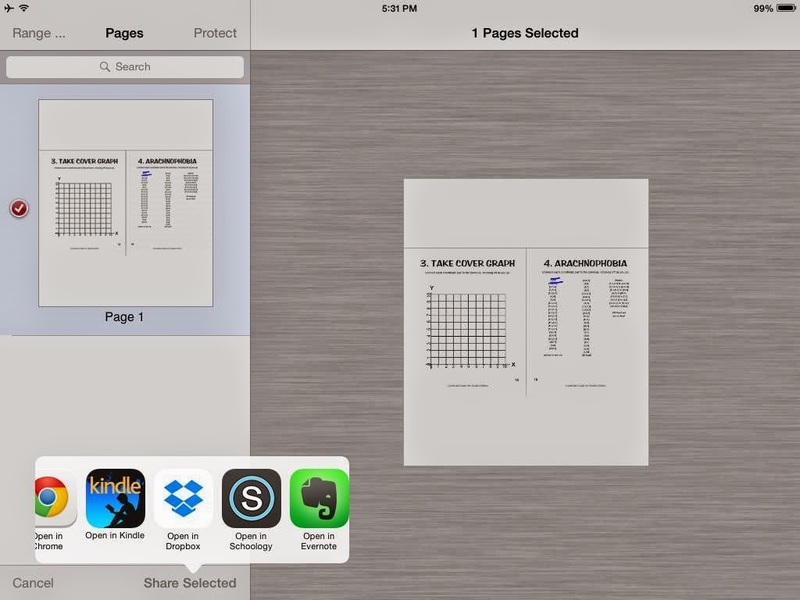 You could get away with just the teacher edition by posting the graph paper and instructions separately, and having the students toggle back and forth on the iPad between the screen shot of the directions, and marking up the graph paper in a note-taking app. 2. Screen-shot or copy/paste the graph you want to assign into your online assignment posting. We use Schoology (which has a paid and free edition), but you can now attach images/files through Remind101 as well. 3. Students access the online assignment and download the images to their camera roll. 4. 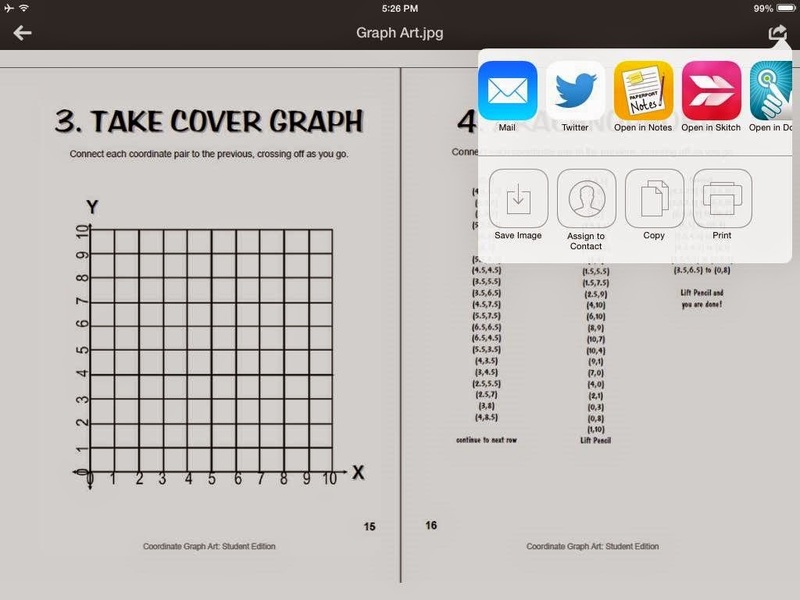 Students import the graph page into their note-taking program (Skitch or PaperPort Notes are both free, but I like Notability the best - which is paid). 5. Students use the writing function to complete the graph picture, toggling back and forth between their note-taking app and their camera roll to find the new point. Once complete, the student could color in the picture as well if desired. 6. Students use the "export" function in their note-taking app to submit their work back to the teacher, via Schoology, email, or whatever other tool you use to collect work. No paper needed! I'd love comments back, as to how this procedure works out for you. This morning I had an epiphany: Why don't I use this same setup and turn on Reflector App on my iPad, so the kids could show their apps & games on the big screen as well? My kindergartener is absolutely LOVING the Minecraft Pocket Edition iPad app, but I only allow him to use the "creative" mode. It's like Lego's on steroids... he can build blocks, dirt, rivers, bridges, "lay animal eggs" to create chickens/sheep/cows/pigs, as well as dig holes and fly around in the sky. The animals make noises, move around, eat, and can even swim. It's a hoot! You never know what they're going to do. They can also get hurt, fall, or stuck in holes, so we've had lots of good discussions about "taking care of his virtual pets". It's hard to see the game just looking over the player's shoulder though, which is why the Reflector piece is nice. It also makes the game more interactive, blowing it up to 500% on our TV or on a classroom Smartboard. For a kindergartener with limited motor skills, he has made several amazing cities with their own themes (bridge city, animal city, car city, just to name a few). While this app is $6.99, it's totally worth it, compared to the small fortune most parents spend on Lego kits. If you really want to see the potential of Minecraft, check out these amazing virtual creations. Alas, I digress. Back to the point... So I have my MacBook hooked up via HDMI adapter to our TV, I also have the WIFI connected on all our devices via the same home network. I then open the Reflector program on my computer (which you can try out and/or pay for the full Mac or PC version at www.airsquirrels.com) and set it to "no password". 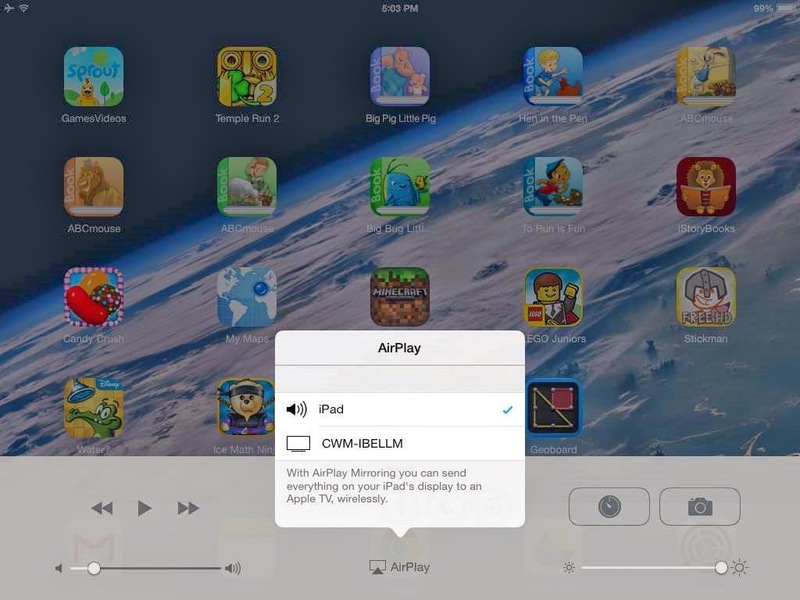 The next step is to turn on Airplay on each device you wish to reflect. This could just be your teacher/parent machine, or student iPads or Smartphones. They do need to be logged onto the same WIFI network in order for this to work. You should see their display pop up on your computer monitor once they toggle the "mirroring" button from OFF to ON. The device sound should also begin playing, so you may want to ask them to silence the app. You can get this going on several student devices at once; however, the more devices that are mirroring, the smaller their screens will get, and the more likely your WIFI connection will make Reflector glitch out or lose the sound feed. Once you do have all the devices reflecting on your screen, you can move them around, resize and reposition them, and then continue working on the other sections of your computer. Whether you choose to use this tool as a monitoring function (in class or as a parent) to keep an eye on students as they work, or as a display function to model and discuss what a student is working on, it is a fantastic way to get to those "modification" and "redefinition" tasks on the SAMR model. You are creating a collaborative, interactive work space in which not only the teacher can display a website or Smart file on one side of the screen, but students can input their own work products to enrich the classroom learning experience. Now, if you're REALLY tech savvy, maybe you have ScreenCast-O-Matic running on your computer at the same time; so not only are you making a collaborative lesson, you could be recording the whole presentation to post later on your online classroom learning space. The possibilities really are endless. One last thing... when you're done, MAKE SURE you have students not only TURN OFF their AirPlay, they also need to CLICK THEIR DEVICE next to the sound bell, to stop projecting audio to your computer. Or, easier yet, simply shut down the reflector program on your computer which will detach all devices. Thanks for reading! Good luck with your collaborations! I'd love to hear all about them so I can share with teachers in my district. My Screen Recorder Pro is an excellent screencasting tool. Records your screen and audio from the speakers or your voice from the microphone - or both simultaneously. The recordings are clear and look great when played back on your PC or uploaded to YouTube. It will record directly to AVI, WMV, MP4, or FLV. Just perfect for creating tutorials, demos, and presentations. Plus, there are no limits on recording length.